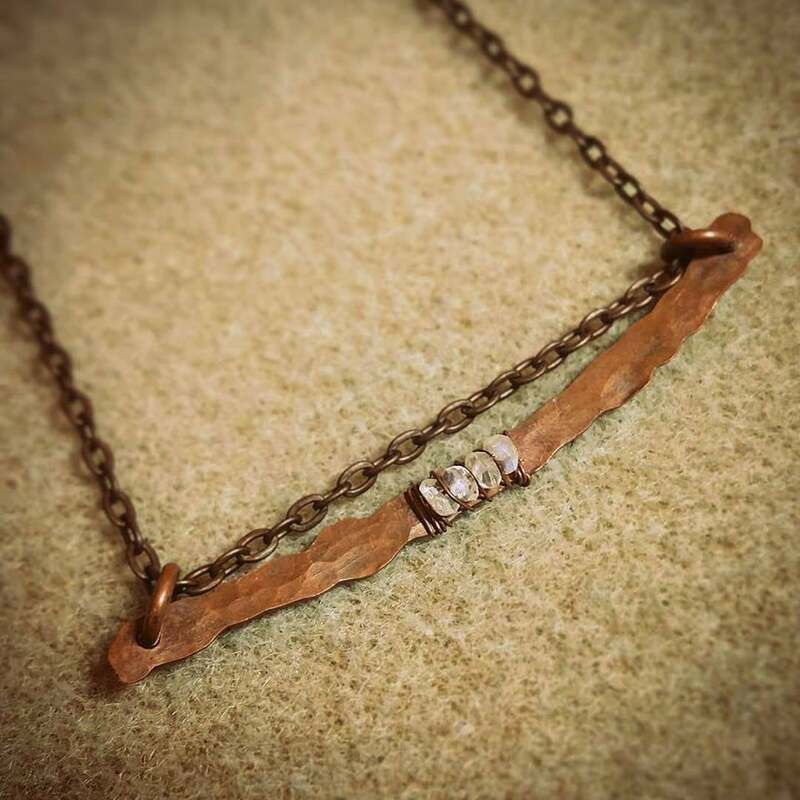 Q AND A WITH JEWELRY ARTIST HOLLY SALADINO — REBECCA DOLBER | R.E.D. HOLLY SALADINO is a jewelry artist living on the East End of Long Island. I first discovered her work at Island Bead and Jewelry, a local store where I used to work and teach. There was a board of her jewelry just to the right of the register filled with copper, wire wrapped pendants, bracelets and other intricate pieces. I'd never seen anything like it in the store before and I immediately asked the owner whose work it was. She told me it was Holly's, their new employee and another independent jewelry artist! I knew I had to meet her. To my delight, Holly was as interesting as her jewelry. 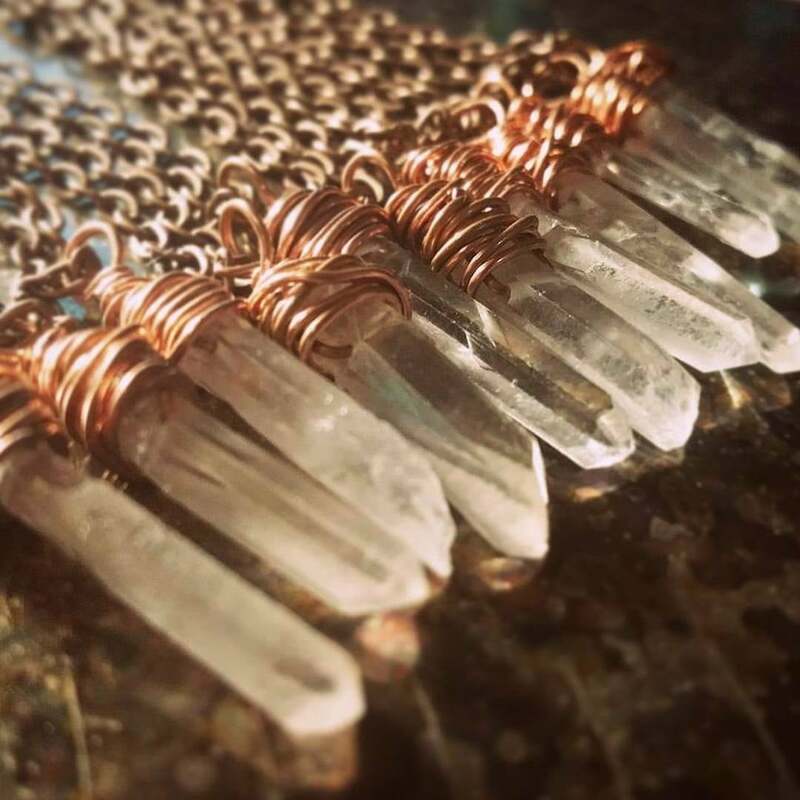 Since then, we've collaborated on a project and enjoyed chatting with one another about supplies, techniques and approaches to selling jewelry. 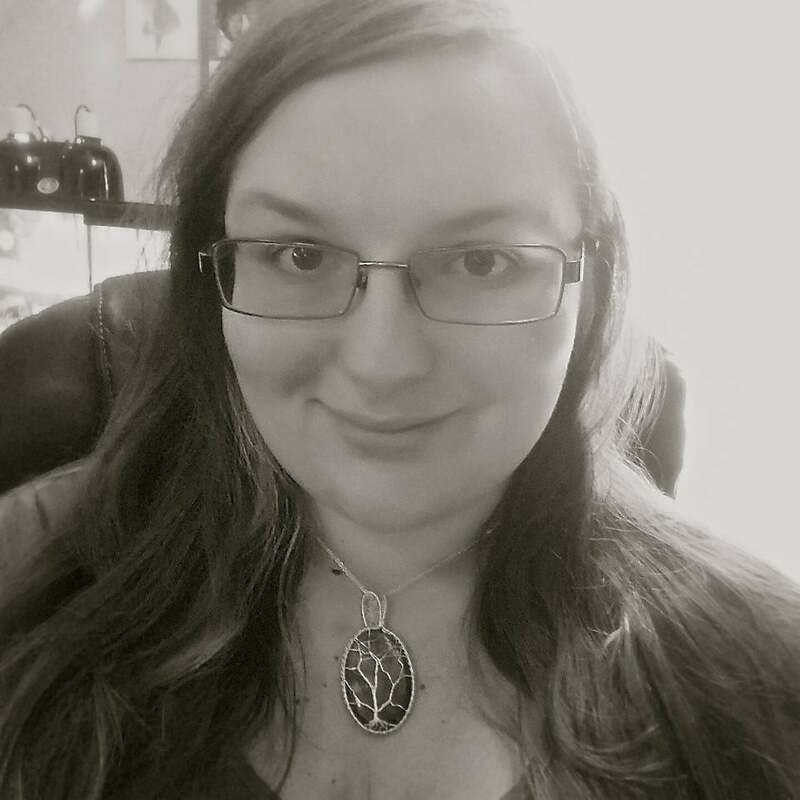 Her website, DBJJewelry.com showcases a nice selection of her work, but where she really shines is Facebook and Instagram. Keep an eye on this crafty East Ender because we haven't seen all there is from Holly Saladino. What’s your first memory of being crafty? I don't remember a time when I wasn't crafty! My mother would always have projects for me to keep myself entertained. As a kid, I had a shelving unit in my room that took up a whole wall and 85% of it was crafting supplies. I started making wire wrapped jewelry in 2011 when my boyfriend bought me a wire wrapped jewelry set as a Christmas gift. I immediately fell in love with the style and decided to give it a try; here I am five years later! What’s your process? How do you create? In all honesty, unless it's a custom order or a sketch I've drawn out, I just go with the flow of the piece. I have a pretty embarrassingly large collection of gemstones. Whatever is calling to me that day is what I work with. Everywhere. My main spot is at home on my computer desk; what’s interesting is that my actual work area is only about a 1x2 foot spot. I have a gaming computer so it takes up space! If I leave home and go to a place where I’ll be sitting for a while, I’ll fill up a tote bag with some basic supplies; quite a few of my pieces have been made on-the-go, either at craft fairs, the boyfriend's house, or even in the car or in-between classes at college. What do you want people to know about being an entrepreneur and your company, DBJJewelry? Being an entrepreneur is difficult but it's sooooo worth it. As everyone predicts, being your own boss is fantastic; at times. The rest of the time, it's hard work, determination, and sleepless nights, especially when you have an idea in your head and you want to get it done. I take lots of pride in my work. Every piece of jewelry is made with genuine products, real gemstones, quality wire, and is exactly what’s advertised. My favorite projects are custom orders because I get to include a piece of the customer in the final product; it's never just what I've created. Having the ability to produce what is inside of someone's head feels more than amazing! Where can we find more of your products? A lot of my finished projects are for sale on my website, www.DBJJewelry.com. Everything else gets posted to my Facebook page, www.facebook.com/DBJJewelry, and to Instagram at www.instagram.com/dbjjewelry/. Where do you find inspiration/who has been inspirational to you/what sorts of things influence your work? I find a lot of inspiration in other artists and works that I see posted in the big collection of Facebook groups that I'm a part of. With that said, I never copy another artist’s work. That’s not inspiration! Tell us about being an artist out on Long Island? What do you like about it? What are the challenges? Being an artist on Long Island has its good points and bad points. The good is that there are a wide variety of people to sell to. With the affluent vacation crowd that comes out in the summer, there's always a chance you'll score a huge sale. The downside is local craft fairs cost a lot of money, and you have to have enough inventory to be able to offset those costs. Every piece of my jewelry is handmade from scratch, so it's a challenge to build up a large inventory of popular items like my larger sized pendants. What are you working on for 2016? Do you have any goals? I want to build out more of my website and get more items listed. But, my biggest goal is an ongoing one, which is to continually improve my skills as an artist. Good luck to you, Holly!